The New York Times Science Times section on Tuesday had an article discussing why real life couldn’t be as engaging as games. One section referred to games designed by researchers to spark cooperative behavior or get people to compete on being most helpful. …Dr. [Jane] McGonigal…has designed Cruel 2 B Kind, a game in which players advance by being nice to strangers in public places, and which has been played in more than 50 cities on four continents. She and her husband are among the avid players of Chorewars, an online game in which they earn real rewards (like the privilege of choosing the music for their next car ride) by doing chores at their apartment in San Francisco. Cleaning the bathroom is worth so many points that she has sometimes hid the toilet brush to prevent him from getting too far ahead. Other people, working through a “microvolunteering” Web site called Sparked, are using a smartphone app undertake quests for nonprofit groups like First Aid Corps, which is compiling a worldwide map of the locations of defibrillators available for cardiac emergencies. Instead of looking for magical healing potions in virtual worlds, these players scour buildings for defibrillators that haven’t been cataloged yet. If that defibrillator later helps save someone’s life, the player’s online glory increases (along with the sense of fiero). 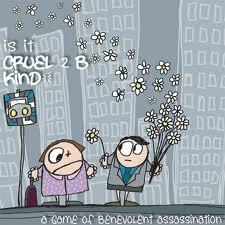 Cruel 2 B Kind is interesting. It takes place in a defined real world environment: e.g., it could be Central Park from 5-6 on 12/10/2010. No one knows who is playing and who isn’t but all players have to remain in the open in that location for the entire duration. Each player is randomly assigned a fatal weakness from a list of possibilities (e.g., being serenaded, being complimented, being cheered on). In order to slay your opponent, you have to engage in these acts of kindness frequently, willing to have complete strangers (not playing the game) be “collateral damage” in your effort to slay your fellow gamers. The result is a war of kindness within the “arena”. See earlier blog post on The Extraordinaries (now renamed as Sparked) and Thin-Slice Volunteering. This entry was posted in Chorewars, cruel 2 b kind, Extraordinaries, First Aid Corps, Games, Jane McGonigal, John Tierney, kindness, new york times, On a Hunt for What Makes Gamers Keep Gaming, research, social capital, Sparked, trust, videogames, volunteering and tagged chorewars, cooperation, cruel 2 b kind, First Aid Corps, Games, Jane McGonigal, John Tierney, kindness, new york times, On a Hunt for What Makes Gamers Keep Gaming, research, social capital, Sparked, trust, videogames, volunteering. Bookmark the permalink.